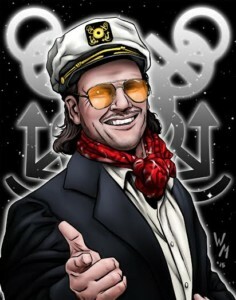 Chikara Immortals Will be Smooth Sailing! The highly anticipated return of Chikara to Filsinger Games is being headlined by perhaps the most highly anticipated card. Smooth Sailing Ashley Remington won the hearts of the Chikarmy in his debut in May 2014, and is sure to win the hearts of Filsinger Games fans worldwide with his upcoming game card! Coming into a fortune left to him by his uncle Lester Crabtree (the former Darkness Crabtree) upon his death, Remington decided to use his fortune for the good of wrestling. He is a skilled technical wrestler and always obeys the rules. Its hard for anyone to get mad at Remington, even his opponents get a lovely fruit basket as a consolation prize. Prepare to swoon for Ashley Remington when he joins your Chikara promotion this December when Chikara Immortals is released this holiday season! And watch for more sneak previews every Monday!